Although the formulas are different, the Know Sure Thing (KST) is similar to that of the MACD. KTS was developed by Martin Pring to show the overall momentum of a financial instrument. The Know Sure Thing aka KST is typically used to identify trade signals or to confirm trends. Buy signals are triggered when the KST crosses above the zero line, or above its signal line. The inverse is true for sell signals. If the KST stays above zero during an uptrend, it confirms the trend. The inverse is true for a downtrend. The KTS can also be used to locate divergence with price. If prices are making new highs, whereas the KST is not, it indicates a slowing price momentum. The inverse is true for making new lows. 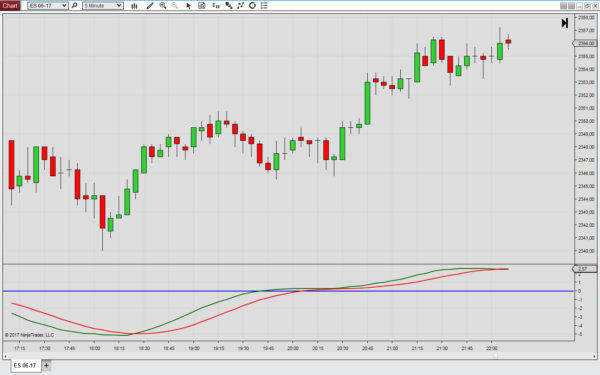 The Know Sure Thing indicator is available for NinjaTrader 8.